Wow a new site and our own section. Now if I could just use these buttons right. Re: Wow a new site! them buttons up there are more TOYS.. i like the "new bord" too, nice work mr "shayman".....as b man sayz have fun.....tiny. I got a bit flumaxed when the old bookmark didn't work! But I finally foud the place. And an On30 board as well! I tried a few buttons, but could not seem toget them to work right. Must be the old brain functions can not understand the new math. Do like the way the site looks. I sure would like to hear some news on the up coming products. navigating & to register. Thats OK it's -5 outside & -25 windchill. I did make a trip to LHS today. 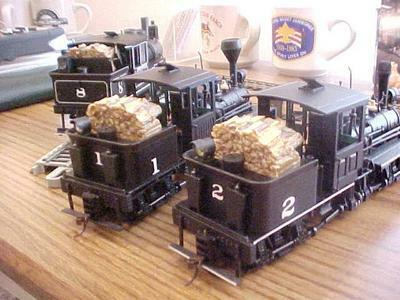 The local Lionel club had an open house. The coffee & conversations were warm and friendly. This new look, whell looks good. Although what the world is gonna be the On30 items comming out! This is very suspenceful and I am hopeing that the locos will be of the sort with new road names and styles, the 10-wheeler with the E.T.&.W.N.C marks is the thing I hope is comming out of the rounhouse. It'll help save tweetsie railroad from becoming a thing of the past you know. I agree with the comments here about the site, I usually just read the posts as the information presented has been informative and helpful. All I need to do now, is learn how to navigate properly. Lets hope the spam is stopped or at least reduced considerably. I see y'all have done a lot of work since Pittsburgh! Very nice site. Hope it works well. Hi I am trying something new here. Well that even looks like me more! I guess we are happy that the spam might only be history from here out .. I do like Spam but only the editable type that comes in a metal tin..